Jeffrey Pollack has had an interesting path to where he is today. The Commissioner of the WSOP has seen the sports industry develop from the infancy of the digital information age, into the 800 lb gorilla of digital media it currently is. Originally from the political world, Pollack founded a newspaper called the Sports Business Daily in 1994, which was the first daily trade publication for the sports business at a time when the industry was just coming into its own. Stints at the NBA, and NASCAR have led Pollack to an interesting, if logical place – the World Series of Poker. Hired last year as Harrah's VP of Sports and Entertainment Marketing, Pollack was named to the newly created title of Commissioner of the World Series of Poker in January of this year. 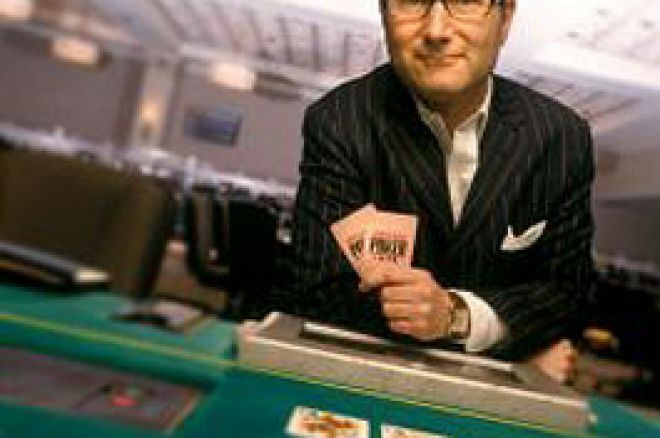 I sat down with Jeffrey recently to talk about what he's learned about the poker business, and what we can all expect at the 2006 World Series of Poker. John: As Commissioner of the WSOP, it seems that you have a challenge in front of you that is fairly similar to your last challenge, which was to bring NASCAR, kind of a sequestered 'good ol' boy' sport into the mainstream. Talk about the process of bringing poker, and the World Series of Poker into the mainstream, and what you have seen, and done so far. Jeffrey Pollack: I think that poker is already part of the cultural mainstream. It is not part of the commercial mainstream. NASCAR, for 50 some odd years built a very strong/passionate/loyal following in much of the country. But NASCAR did not break through until it consolidated its media rights, and started approaching Madison Avenue in a different way. The World Series of Poker has this wonderful, rich 37 year tradition &amp; heritage which I completely respect, and think we should celebrate. But, for all that heritage and tradition, it's the new kid on the block on Madison Avenue. We have never had a sponsor until this year, and we're about to make an announcement about our first ever sponsor, and some other similar arrangements that will be in place before this tournament. We are presenting ourselves to consumer product companies, and global media companies in the way that you would expect the NBA, or the NFL, or NASCAR to be presented. So, there are a lot of similarities. I think we are where NASCAR was about six years ago, and we are positioned for some very explosive growth. Having said that, we're not going to have the popularity of NASCAR, or the NFL. It's a very different beast. Poker is not athletic competition. There is a very passionate following. It's what sports fans like to watch, in addition to more traditional sports. So, we have a great landscape in front of us. But, I am very aware that we are different. Because it's Las Vegas, because its part of the gaming industry, it's non athletic competition. But, there are going to be plenty of companies that want to appreciate, and embrace that difference. It's my job to find those companies, and create meaningful opportunities for them to step into the sport. Then you ask, why is it important that they step into the sport? Because it's about exposure, and growth. The playbook that I'm using in growing the World Series of Poker is the exact playbook used by NBA, NASCAR, the NHL, and the NFL. Sports management is a very specialized business and profession. I know it pretty well. My team knows it very well, and we are applying principles that have been proven and tested for the past 30 years. Some foundations of those principles include recognizing that you have to get what happens on the competitive playing field right above and beyond all else. So, for me that means making sure we have outstanding player relations, and customer service, and making sure we have the best possible tournament structure. Introducing the new H.O.R.S.E. event was really an opening statement on our part, to say that we will not be afraid to adjust the structure of the tournament. My sense is that there has never been a truly critical eye placed on the tournament structure. Or, at least not as frequently as it should have been over the past 37 years. That's not a judgment, just a fact. We're coming at this a little differently. So, the H.O.R.S.E. event is our first attempt at making the World Series of Poker a little more exciting, and more interesting. Over the course of the next five years, you'll see other adjustments. If you get what happens on the playing field right, then you are in a position to go attract media partners. We just announced a multi year television deal, we have a deal with AOL that's well underway, and we have a deal with Glu Mobile, one of the world's largest mobile content providers. So, we're setting up the same lines of broadcasting, and new media business that any other sport has. You do that, because you always want to attract the biggest possible audience, both in terms of registrants at the venue, and viewing. And, the viewing takes many forms. We live in a 24/7 digital world, where sports consumption habits are just very different. But, you get the media exposure, and the business grows. That includes sponsorship, licensing, international growth and new business opportunities for the players themselves. John: I wonder if you might talk a little about your background, and how that has led you to this job? Jeffrey: I come from a completely non traditional business background. I started my career as a political consultant. So, my view on the world is grounded in strategic thinking. Being able to have a vision that is nothing more than an abstraction, and then breathing life into it. A political campaign is nothing more than an abstraction when it starts. My specialty is doing what's never been done before. When I started the Sports Business Daily, I knew nothing about sports, I knew nothing about publishing, I'd never run a business, but I had run political campaigns. That was taking an abstraction, this concept for a business, and breathing life into it. When I went to the NBA, I knew nothing about collective bargaining, and they had never had a communications consultant during collective bargaining, so that was completely uncharted territory. When I went to NASCAR, their broadcasting and new media group was brand new. They had just consolidated their media rights – completely uncharted territory. The World Series of Poker was, frankly, the logical next step for me. Because it's this brilliant 37 year old start up. It is an abstraction from a business standpoint. It is, to a degree still an abstraction from a global branding standpoint. We have a tremendous running start – 37 year history – most prestigious - biggest – richest – world renowned. But, that all happened without any deliberate effort or strategy from a business, or branding standpoint. So, it is still, to a degree, a touch of an abstraction, and that is my sweet spot. Give me what has never been done before – give me a blank slate – and I will get it going, and that's what we're doing here. John: So, is it the simply the product that has carried this thing forward for 36 years in your opinion? Jeffrey: I think it's the product, and the mystique and the history. I don't believe that there has been enough celebration of what led the World Series of Poker to this point, and that pre dates the Harrah's acquisition. It goes from the first tournament forward. It is colorful, it is rich with personalities, it is Las Vegas at its best, and its worst. I want to do more to celebrate our past champions, the people that hold bracelets from previous tournaments. As we rush into a digital future, I want to bring our past, our history, and our DNA along for the ride. Because, I think it is our competitive advantage, and I think it is what makes us so special. Join me tomorrow for part two of the interview when Jeffrey discusses more about what people can expect from the WSOP this year, and in years to come.